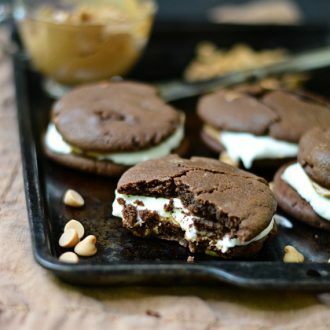 Today’s recipe is from my gal pal across the ocean in Jamaica, Jessica from Jessiker Bakes! Jessica, as you can tell from her blog name, loves to bake and we had an instant connection over our love for baking, TV shows and ridiculously insane procrastination skills when it came to studying. Like how I found out late one night that she had never tasted butterscotch before and had to describe what it tasted like instead of making a presentation due the next day. Eventually I just mailed it to her because one cannot go through life without experiencing the wonders of butterscotch. 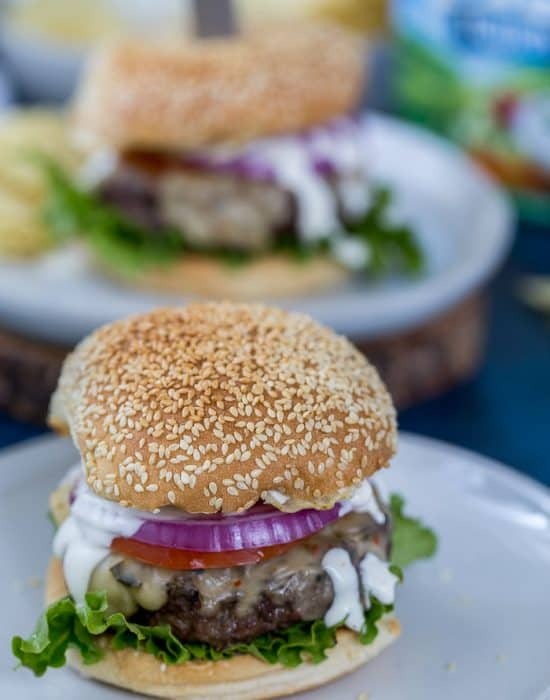 Today she is sharing a delicious savory recipe with you guys because she loves making healthy dishes as well as decadent cupcakes and brownies. Hi I’m Jessica from Jessiker Bakes! I’m so happy to be guest-blogging on Zainab’s blog and since I met this chick we haven’t stopped chatting whether about food blogs, dessert or our equal obsession with Suits and House of Cards! 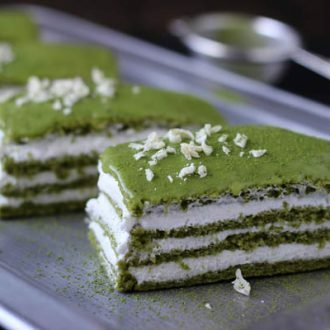 As you probably know, Zainab’s blog is mainly a dessert blog but she has been integrating the delicious savoury food that she eats also. 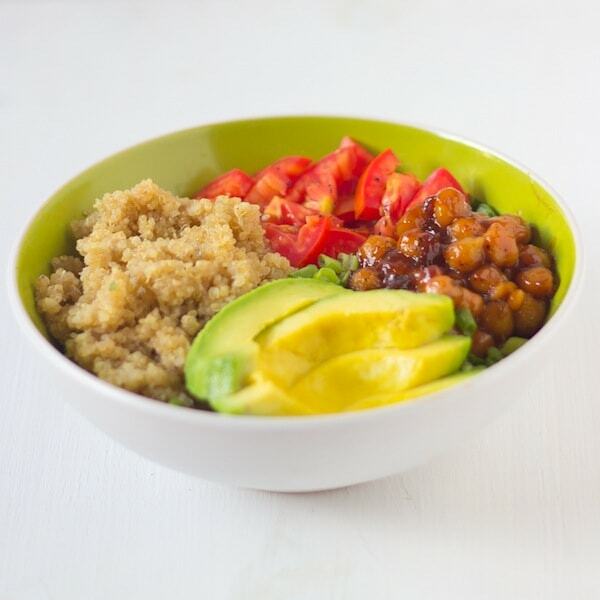 I thought this Honey & Lime Quinoa Bowl with Spicy BBQ Chickpeas was a great addition because it is an insanely delicious bowl meal that can actually be easily made vegan. 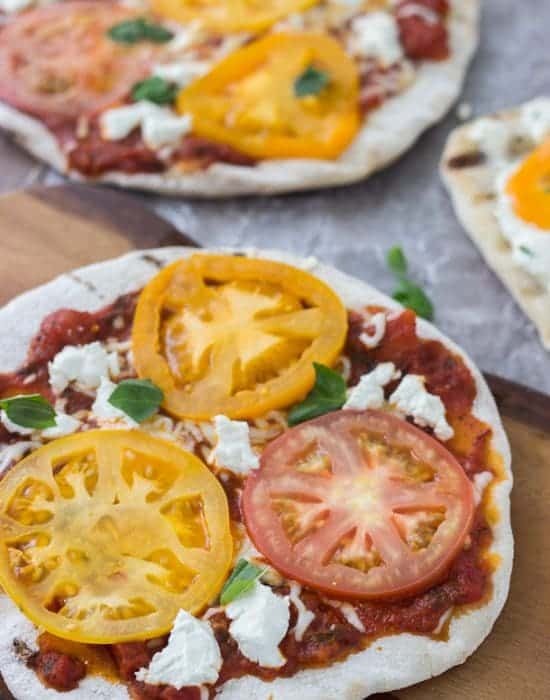 It’s also gluten-free and basically, perfect for any lunch or dinner that you’re preparing. I thought about this recipe during my quinoa obsessed days (they still haven’t passed) and was looking for a slightly new way to enjoy my already favourite grain. The honey and lime came from a random combination in my mind that ended up in a slightly sticky sweet and sour combination that you’ll fall in love with that will replace any fried rice. Naturally, avocados will always have a place in any bowl food and the tomatoes were for a pop of colour and plus, they’re my one of my favourite fruits/vegetables (has anyone decided on which one it is yet?). If you’re not a tomato fanatic you can swap this for red bell peppers or anything else you desire. I particularly loved the colour variation and have been told that the brighter your food, the more you’ll enjoy it. That might explain my love for any dessert covered in sprinkles, hmm. The BBQ chickpeas became an obsession after trying this experiment. All you have to do is simply heat the already cooked chickpea in your own homemade barbecue sauce or a store-bought version, and you get sticky, spicy and smokey covered chickpeas. You are going to LOVE these chickpeas. After trying this meal, I had it everyday for an entire week, mainly for the chickpeas and the quinoa. I think you will definitely love how everything comes together, so you have delicious quinoa and bbq chickpeas in one bite, avocado and bbq chickpeas in another bite…it goes on and on. The best part? This meal is pretty good for you. You’re getting a chuck load of nutrients from the quinoa namely tons of protein, magnesium, fibre and so much more than I can list, delicious healthy fats from the avocado and chickpeas are present to help you get a healthy heart plus even more protein and fibre! Whoa, I don’t know about you, but I’m gearing to eat this again just for the taste…I mean the benefits! Don’t you love when the food you eat has such great positive side effects? This meal comes together pretty quickly. You can enjoy this entire meal in 30 minutes, and that’s with enough time to set up in front of the television, turn on your favourite show and then start eating. I really hope you enjoy this meal and come back for seconds! 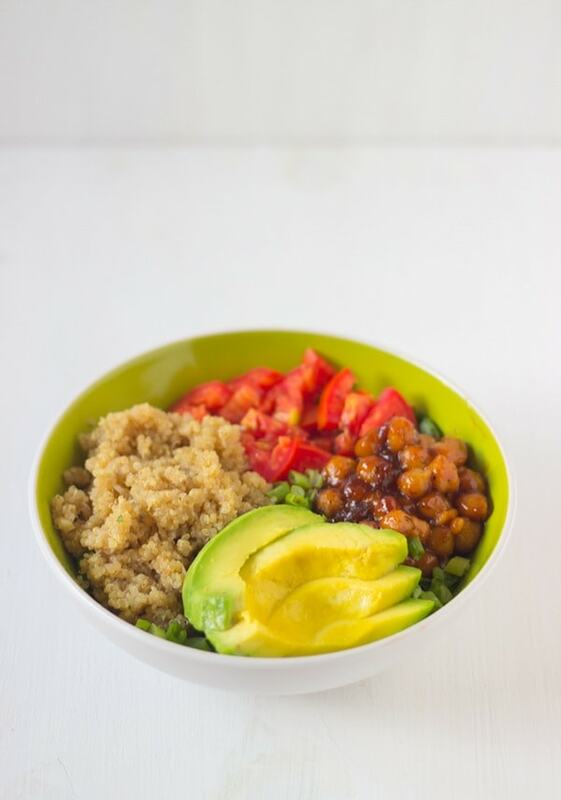 This Honey and Lime Quinoa Salad Bowl with Spicy BBQ Chickpeas comes together on 30 minutes and is packed with delicious flavor! Wash the quinoa in a mesh strainer rigorously with water. pan and letting it heat up for about 2 minutes. Add the broth to the pan and the salt. Stir, and bring to a boil. the water has been absorbed, the quinoa is finishing cooking. Use your fork to fluff the quinoa a bit. You will only need ½ cup for one serving. In a small pot over medium heat, place the chickpeas and 2 tablespoons barbecue sauce. Heat for about 5 minutes until warm and the sauce becomes sticky and coats the chickpeas. 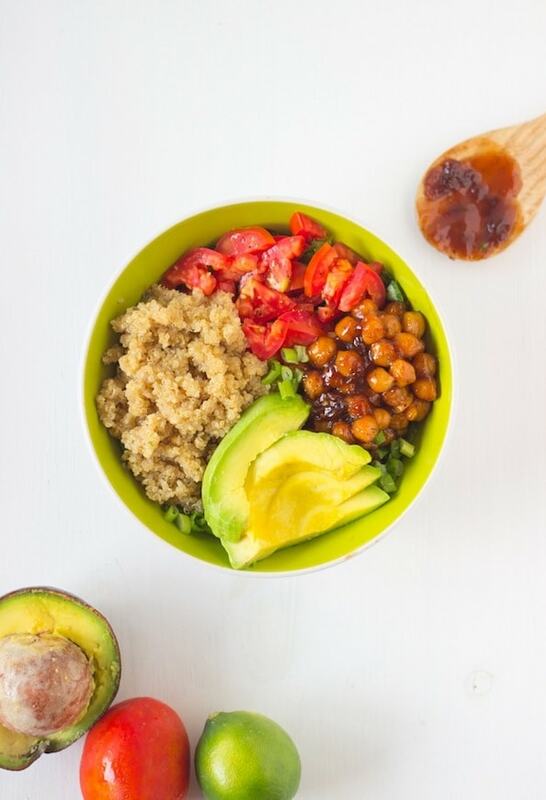 own corners, ½ cup quinoa in one, then bbq chickpeas, the tomatoes and the avocados. Sprinkle with the chopped scallions. Enjoy! 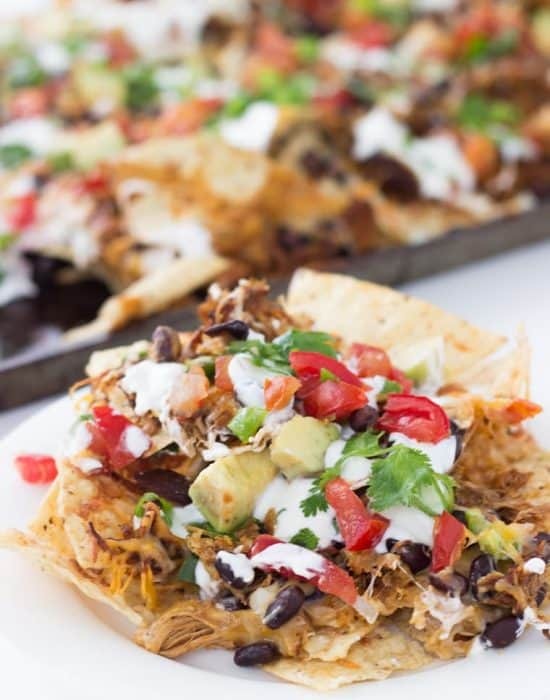 VEGAN - This recipe can become vegan by using agave nectar instead of the honey, using a vegan barbecue sauce (most are) and a vegetable broth. Here’s how you can keep in touch with Jessica and get more of her delicious creations. She is on Facebook, Twitter and Pinterest. Of course you can always check out her blog, Jessiker Bakes where she cooks and bakes daily!! Spicy BBQ chickpeas?!! I love this! and totally going to check out Jessica’s blog! Hahaha! I love that you mailed her butterscotch, that is the best ever! Jessica, when I saw BBQ chickpeas, I nearly fell off my chair. That is genius and sounds oh my gosh good! Love love love this salad and pinning! Hey Jessica! This does sound like an awesome bowl to have for lunch! Packed with flavor and colors!! Plus it sounds like something i’ve never had – at least the spicy BBQ chickpeas, sounds indulgent! Thanks for sharing lady 😉 And hope you’re having a good week Zainab! Thank you Kelly! 🙂 You’re quite welcome! It’s great seeing you here, Jessica! Damn girl, that’s one good looking, healthy bowl of deliciousness there! I always have quinoa and chickpeas in my pantry, and tomatoes/avocado is one of my favourite combinations. I’d hoover this down in no time! Thanks Ala, you’re so sweet! I love a good filling quinoa bowl. 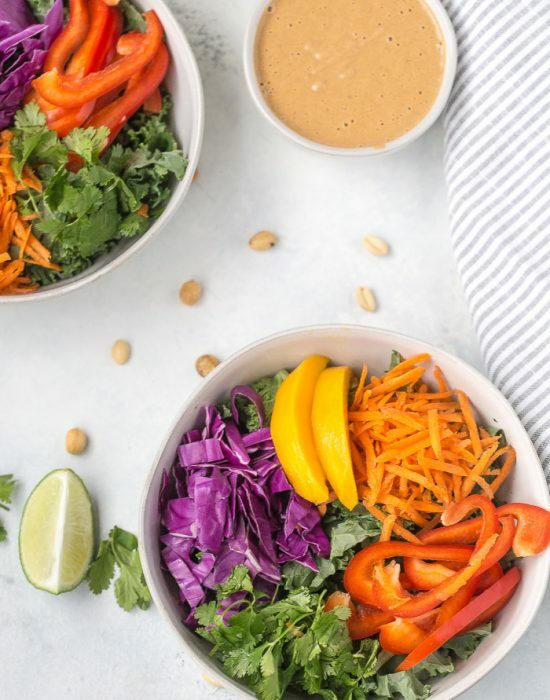 This bowl is so colorful and delicious! 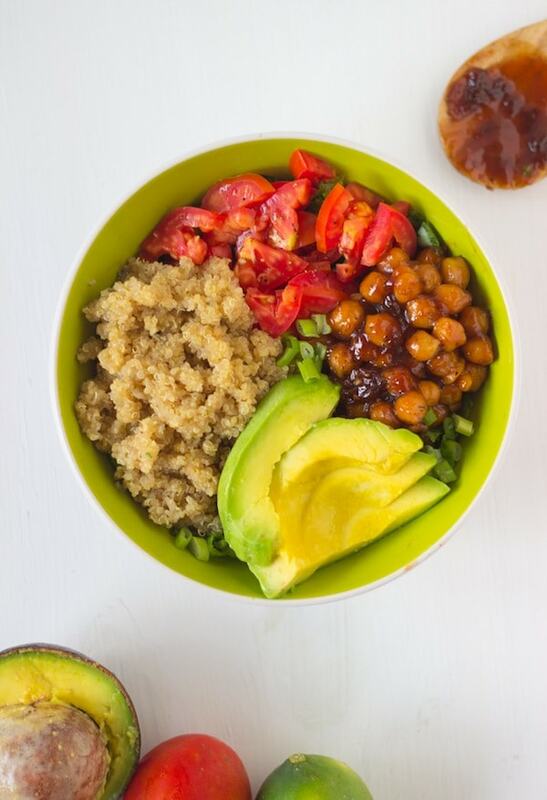 Love bowls of goodness like this, spicy chickpeas wow! Wow!!!! JUST ABSOLUTELY wow!!!!!!!!!!!! This looks incredible! The perfect dinner, if you ask me! This is what I want for lunch!! I have to try chickpeas like that, looks scrumptious! Wow. I just love the flavors here. So healthy and soo delicious, I’m sure. This is what I’m craving! Love it. So nice to ‘meet’ you Jessica! 😀 Love discovering new baking sites! Thank you Tammy! So nice to meet you too! BBQ AND avocado???? You steal my heart. BBQ chickpeas sound amazing! What a flavorful and healthy meal. LOVE!